It's strange that nobody is started this subject here yet ? This new strange object is quite easy to see, this morning I estimated a +12.3 magnitude, quite stable. If you'r an earlybird try it! After CTA102 and the last micro lense, it's just a small point like a faint star too, but this is really another exotic object. March 17 - 4:00 UT I did a difficult visual estimation: mag +14 but the light curve is going up. I'm going to try to image this interesting tonight. It seems the AAVSO has been studying this object for at least a year. I imaged ASASSN-18ey last night (3/20) and estimated its magnitude at 13.8 using comp stars 129 and 138. 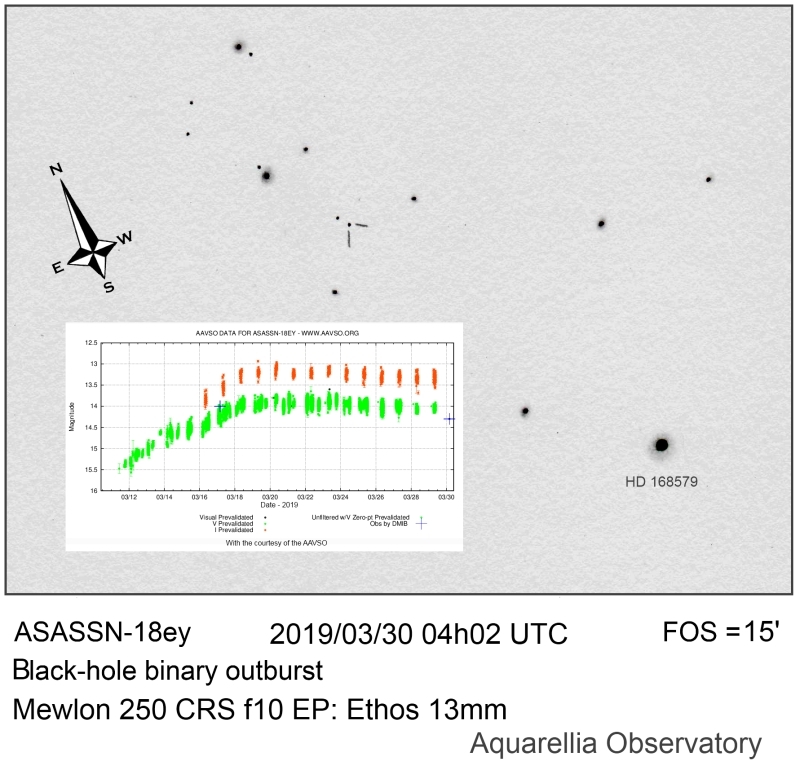 I imaged ASASSN-18ey again last night (3/21) and it's starting to fade. I estimated its magnitude at 14.0 using comp stars 138 and 146. Same impression that yours Rich, this morning I estimate the mag : 14.3 with the same stars than yours. Anyway that was difficult with my small 250 Mewlon, only glimpsed. Here my last "composition"